The swift move from martial law to a full coup d'etat in Thailand has some analysts wondering if this outcome is what the Thai army planned all along. Thailand's army declared martial law 20 May in an effort to quell unrest across the deeply divided kingdom that has been shaken by violence since anti-government demonstrations erupted seven months ago. Only two days later a coup was declared. Though many expected the coup to take place after martial law was announced, almost no one expected it to happen so soon. Thailand has seen months of debilitating protest against the government of former premier Yingluck Shinawatra, who was dismissed from office by the courts for abuse of power just weeks before the remainder of the beleaguered leadership was ousted in the coup. 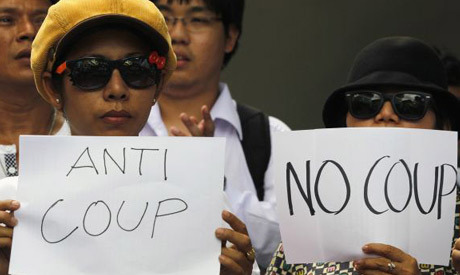 Prior to the coup, demonstrators had called for political "reforms" before an election in a bid to rid the country of the influence of the Shinawatra family, particularly the deeply divisive former premier Thaksin -- Yingluck's brother -- who was overthrown in a 2006 coup. That military intervention unleashed nearly a decade of often bloody political turmoil, with periodic rival mass protests on the streets. On Saturday, protestors are rallying in Bangkok against the army’s takeover of power. But many fear that sweeping detentions could silence protests. On Friday, the junta chief ruled out elections for at least a year to "allow time for political reforms," and defended their recent action in the face of rising international alarm. US Defense Secretary Chuck Hagel demanded on Saturday immediate elections and the release of detainees held by the junta. The fate of Thailand's fragile democracy is still unclear. Many expect further unrest in the country and more restrictions on political freedoms in a new constitution. Protests have continued since the army seized power 22 May. The coup leader even threatened protestors directly, giving a hint of how the country will be ruled in the future. On 23 May, scores of demonstrators confronted and hurled abuse at soldiers in tense scenes in the centre of the capital. AFP reported on 23 May that the army poured dozens of soldiers into the area to clear it of protesters, some of whom held protest signs with slogans such as, "We will never lick dictatorship's boots." On Sunday, AFP reported that Thailand's ruling junta warned protesters it would not tolerate any further rallies against its coup after tense standoffs between soldiers and angry crowds in the capital Bangkok. After the junta chief announced postponment of polls, rallies were expected Saturday, while several major shopping malls in a downtown commercial district said they would close on Sunday in anticipation of further demonstrations. General Prayut has warned he will not tolerate protest, but so far soldiers and police have lightly enforced martial law. John Le Fevre, journalist at The Establishment Post, a news website that focuses on the Southeast Asian region, told Ahram Online that Thai people are not only rebelling against the coup in the streets. There has been much activity on social media sites such as Twitter and Facebook. “While the army may have stabilised the situation with the implementation of martial law, the declaration of a coup and the abduction of those participating in what amounts to 'peace talks' is likely to inflame the situation “Le Fevre added. “On 23 May, at least five people were reported to have been detained by the army for participating in anti-coup protests, “Le Fevre told Ahram Online. Former premier Shinawatra was also detained by leaders of Thailand's military junta, according to the AFP. Shinawatra and other ousted government leaders would be detained for up to a week. Saksith Saiyasombut, freelance foreign correspondent and Thai political blogger, expects that supporters of the ousted prime minister (the so-called Red Shirts) won’t be happy with this outcome and will resist. However, this will not come immediately as the military are reportedly rounding up Red Shirt leaders nationwide. But according to AFP, Thailand's junta on Wednesday freed leaders of the Red Shirt movement, after holding them without charge for nearly a week. On the other hand, anti-government and ultra-nationalists have been protesting for seven months and Saiyasombut expects them to be very pleased with the coup, since it has done almost exactly what they wanted: it toppled a ”regime” associated with former premier Shinawatra, it suspended electoral democracy for an indefinite time, and probably will see that ”reforms” are rigged towards them. “However, I find it very shortsighted, since hardly anything improved in the political situation,” Saiyasombut asserts. Was the army takeover necessary for peace? In a TV statement on 22 May, army chief General Prayuth Chan-ocha vowed to restore order and enact political reforms. The majority of analysts seem to believe that the coup was not necessary for peace, however, and that martial law was sufficient to restore order in Thailand, but the army claims the move was necessary for maintaining order. AFP reported that the cabinet has been told to report to the military, TV broadcasting is suspended, and political gatherings banned. Andrew Clark, editor at Global Report, told Ahram Online that the army's declaration of martial law was necessary to stop imminent clashes between the two protest groups. The aggressive pro-government supporters had lost patience with anti-government protesters, particularly after it was obvious the courts and senate were against them when Shinawatra was evicted, and were moving from the provinces to Bangkok. Le Fevre said that the RTA (Royal Thai Army) seems to have had difficulty in understanding what the role of a country's armed forces is. “If the Thai army had performed its role correctly and supported the government of the day in maintaining peace and order, instead of following their own agenda, the 2 February elections would not have been annulled,” Le Fevre explained. Will the next constitution be restrictive? After the coup took place the junta declared the suspension of the constitution as negotiations among rival factions failed. Saiyasombut says it’s highly ironic that the military junta scrapped the same constitution it drafted in 2007 after the last military coup with the intention to weaken the powers of an elected government and have more appointees under its patronage. “It is evident that the Thaksin-aligned parties still won elections and stayed in power. So, whatever the next constitution will be, it will most likely be even more restrictive,” Saiyasombut added. Le Fevre agrees with Saiyasombut on how the next constitution is likely to turn out. “Abrogating the constitution is a common procedure. The 2007 Constitution is the 10th since the right to vote was granted in 1932. It's not a surprise, and no doubt the next constitution will insert more control on how the government can operate than the 2007 version introduced,” he added. Another barbarbaric military junta on its way out.